London: London celebrated the two-year countdown to the London Olympics on Tuesday by launching a search for games-time volunteers and opening some of the venues to let athletes test out the facilities where they will be competing for medals after the opening ceremony on July 27, 2012. Organisers were determined to prove the multi-billion-dollar project offers good value for money at a time of economic austerity. 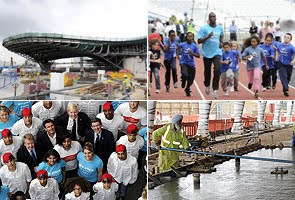 Despite a severe economic crisis and government budget cuts, London looks on track to deliver in 2012. The external building work of key arenas is finished, sponsorship revenues are on target, plans are in place to ensure lasting use of facilities, and British politicians, media and the public remain largely on board. "Believe me, it's going to be a knockout, it's going to knock your socks off, it's going to be, I think, the greatest Olympic Games ever," London Mayor, Boris Johnson, told reporters. Olympic athletes provided a glimpse on Tuesday of what fans can look forward to when the greatest sports show comes to town on July 27, 2012. Four-time US Olympic champion Michael Johnson raced against a group of local school kids for fun on a temporary 60-metre track. Former NBA player John Amaechi shot a few hoops at the basketball arena much to the delight of visitors at the temporary basketball venue. British cyclist Chris Hoy, who holds four Olympic gold medals, took a few spins around a temporary track inside the as yet unfinished velodrome. The government recently ordered relatively modest cuts of 27 million pounds (41million US dollars) in the budget of the Olympic Delivery Authority, the body responsible for building the venues. The overall construction and infrastructure budget stands at 9.32 billion pounds (14.3 billion US dollars). The largest cost is going toward the development of the 2.5-square-kilometre (1-square-mile) Olympic Park in the Stratford area of east London. A deprived industrial area of the capital is being transformed into a new complex that will be turned over to the public after the games.